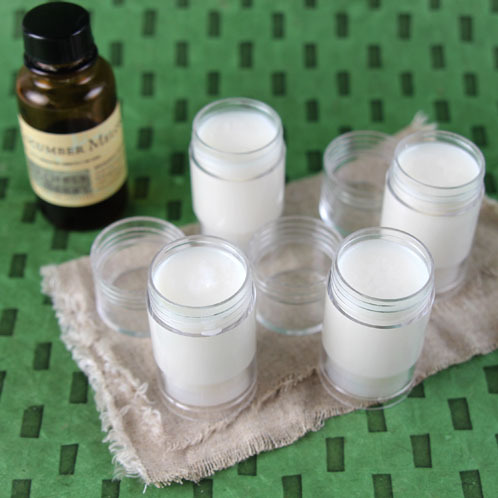 After creating your own deodorant with our Aluminum Free Deodorant Base, you’ll never go back to store-bought deodorants again. Simply melt down the base, add your fragrance or essential oil of your choice and as soon as it’s hardened it’s ready to use. For this project we used the Sample Fragrance of the Month, the light and refreshing Cucumber Melon Cybilla. With every order you place at Bramble Berry this month, you’ll receive a complimentary .5 oz. sample of this fresh fragrance. Because underarms tend to be sensitive areas, we don’t recommend more than a 1 % usage rate when adding fragrance oil or essential oil to this base. In this case, we fragranced the entire 4 oz. container with only 1.5 mL of fragrance oil! ONE: In a heat safe container, empty the entirety of the 4 oz. deodorant base. Melt the base on 20 second bursts until fully melted. When heating, make sure to keep the temperature below 130°F or you will degrade the odor fighting enzymes! 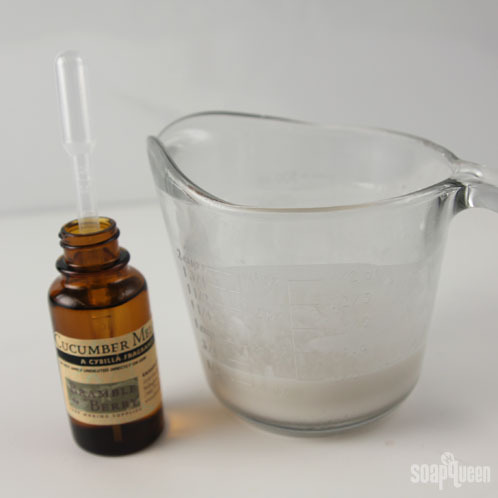 TWO: Add the Cucumber Melon Cybilla fragrance oil and stir to fully incorporate the fragrance into the base. THREE: Slowly and carefully pour the base into the push tubes. The push tubes hold about an ounce by volume so be sure not to overfill them. 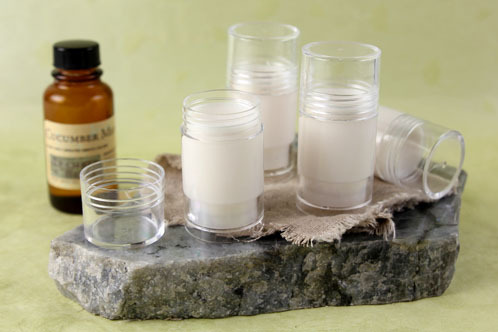 FOUR: Wait 15 – 20 minutes for the base to harden and then your aluminum-free deodorant is ready to use. Look for other scents to try? We also like Fresh Linen, Soapy Clean and Salty Mariner Fragrance Oils and Lavender 40/42 and Lemongrass Essential Oils. I ordered the smallest quantity to try and found I was having a hard time keeping the mixture below 130F. Before fully melted, it reached 140F although I stirred all the time (did it bain-marie). So far I didn’t stink yet , lol 😄. I would love to order the bigger size, but I really don’t know how to keep temperatures low when having the plastic bag in which it comes in the microwave…??? Because the deodorant base is on the firmer side, it may get up to 140F. That’s totally OK! Just make sure to melt the base on 20 second bursts and stir in between each one. 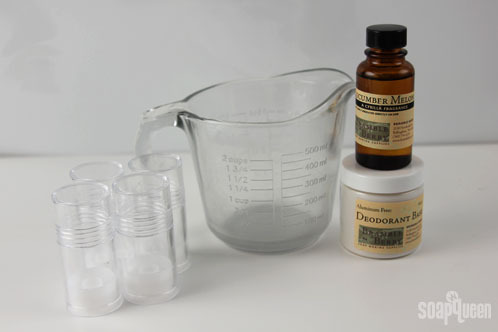 Is the deodorant base oil soluble? I was thinking of maybe adding an extract like calendula to make the deodorant even more soothing. If so, any idea what the usage rate would be? 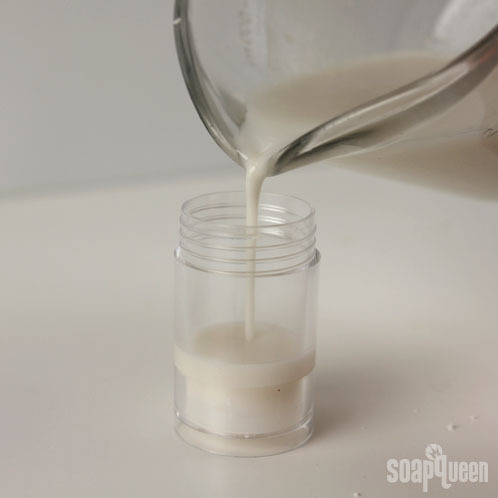 I plan on making this deodrant base next week and I’m wondering what EO’s you’d recommend and how much to use on the 4oz base? Thanks. Choosing a fragrance is a very personal choice, but if you want to use an essential oil, keep in mind that some essential oils can be irritating to the skin when used in leave-on products like deodorant. If this is the case, we make sure to label the essential oil as such on the item’s product page. If you’re looking for an essential oil for this recipe, you might like Chamomile Essential Oil or Lavender Essential Oil. Both are soft and soothing! For 4 oz. of deodorant, you need a very small amount of essential oil. Depending on how strong you you would like the fragrance to be, I would use between .02 ounces (.57 grams) up to .08 ounces (2.27 grams) of essential oil. I just got one of the free samples with my order and I’m excited to try it. I’m new to this because had to find something new to make that didn’t require as much fine motor skill as my crocheting. Is the free sample of Cucumber Melon safe to use in a candle? And how can I know exactly what a fragrance oil is safe for? Great question! Yes, Cucumber Melon is definitely okay to use in candles 🙂 We recommend a usage rate of 1 oz. of fragrance oil per pound of wax. Keep in mind, it’s always a good idea to do a burn test beforehand because some oils can morph when burned or effect how the candle itself burns. Otherwise, it’s perfectly safe to use! I have had a problem with the push-up tubes. The base and the contents will fall out in turned upside down. Is there something else you would recommend. Sorry you are having trouble with the push-up tubes! I would recommend holding the bottom of the base when applying. We do not currently have another push tube option, but I will be sharing this feedback with the team. Thank you! Those push-up tubes are the cutest!! Aren’t they cute? I love them as well 🙂 If you end up making this recipe, we would love to see it on our Facebook page! I made this recipe and cannot get the base to move to push up the product. I even had my 250# hubby try it and it simply will not move. I then tried olive oil to lubricate the sides of the tube, melted one ounce and tried again. No dice, the product will not push out of the tube. Any suggestions? I’m really bummed right now. Hmm, was the tube able to move up before you poured the deodorant? 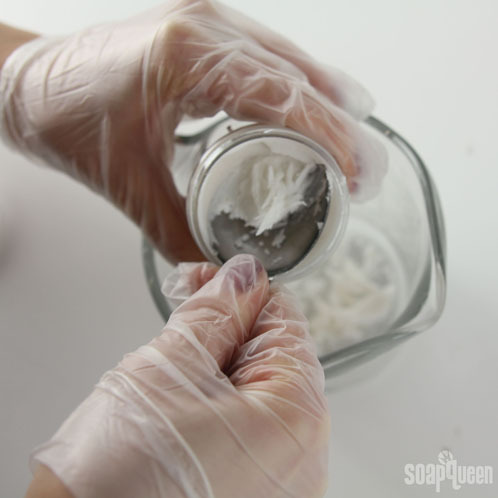 You might try remelting the product currently in the tube, repour it and see if that helps. Let me know, I’d love to help you troubleshoot if that doesn’t work! Base over a water bath? If you don’t want to use a microwave, you could melt the base on a double boiler and add the fragrance once it has melted. Just be careful the mixture doesn’t burn :).